Sue, who plays Mrs Honeyman in the film, has also helped with raising funds. In 2014 we’ve done a few events and raised funds for the Poppy Appeal. We’ve also been able to support other charities as well through screenings of the film. £200 was raised for the Help for Heroes thanks to another screening of the film near Ashford, Kent. 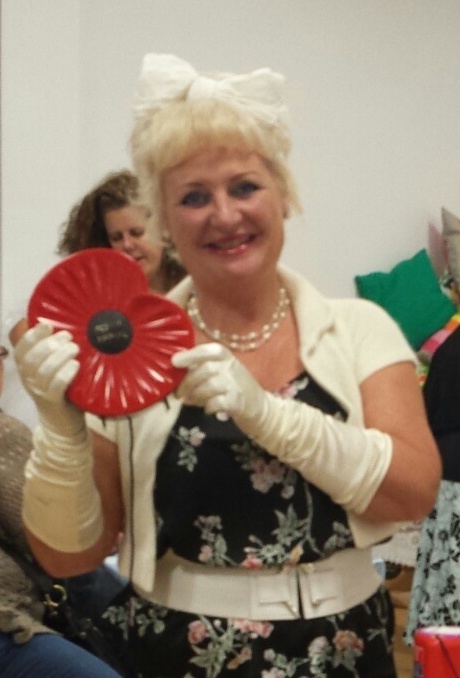 In April we sent another £500 to the Poppy Appeal – thanks to the popularity of the DVD, including at 1940’s events. In September we were pleased to have raised £100 for the work of Bromley Chain. We’ve been delighted to team up with this local charity that offered to work with us after some of their members attended a screening of the film last year. We are so grateful for Bromley Chain’s support in arranging for subtitles to be added to the film for the hard of hearing. Through this partnership we were also privileged to be introduced to staff and children at Griffins, the unit for hearing impaired children at Darrick Wood School, Orpington. We also got involved in some of their activities and events and the pupils were the first to watch Blitz & Bananas with the subtitles. In November, Bromley Welcare volunteers organised a screening of Blitz & Bananas to tie in with the Remembrance weekend. Despite rainy weather, they had a fantastic turnout and raised a magnificent £1,235 !